Recently, I was given the opportunity to speak as a panelist for a webinar on The Value and Impact of Recognition on Human Resources Today website, sponsored by impraise, both great websites you should visit! The recording is now available, if you’d like to go back and watch. Recognition in the workplace can hold a very bad stigma, especially in recent years. It’s not right for the people who keep your company running to get no reward besides a paycheck, that lets face it, probably isn’t that great. On the webinar, I learned a number of great ways to help with employee recognition for small and large companies. I also wanted to bring you a few more ideas on keeping recognition fresh and thoughtful. 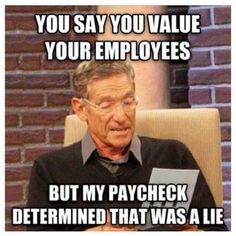 Companies should not feel that recognition and value of an employee is draining because it might cost the company a few dollars. Understand that everyone does not want a grand gesture. In the webinar you will hear all of us discuss understanding the employee you’re recognizing and the value of your company to bridge the gap. If your company is thinking it’s going to cost them thousand of dollars to show an employee recognition, they are only thinking about the way it looks to others, not the way it feels for that employee. A great example? Maybe your employee has been having a tough time recently with work or home related problems, give that employee the option to take off on a Monday, with pay. This allows them to rest for a day or handle the things they need to get done, which in turn makes them come to work well rested and thankful. Don’t over think the recognition. Need to start off small? That’s fine, employee of the month plaques or printable certificates. Social media spotlights, a lot of y’all need to spruce up your company social media standing anyway (I’ll be doing a special in December, stay tuned!). Which National Day is approaching? National S’mores Day? National Pizza Day? If they have to work on a day with a major game, setup a tailgate party. Our employees want the recognition that we do notice the job they are doing, and to take it even further, you need to be able to directly articulate what the actions of good are that led them to this point and how they can continue moving forward. Favoritism Only Hurts. Being a kiss up and being rewarded for it, doesn’t help an organization. Not at the level of manager to employee or leaders to manager. Giving the same employee the same award/recognition every year because they will throw a fit, like a child, means you haven’t been managing correctly and/or that person needs attention. Reminder: Millennial employees aren’t special, don’t act like you’re spending a lot because it’s the only thing that will make us happy. Performance reviews, title changes (when deserved), pay raises, time off, training and development, conference attendance, these are the things we want, not your end of year party. Reward and encourage the people who are doing the work for your company. Recognition should be done because it’s the right thing to do. If you hired a crap employee or didn’t train them well, that’s on management. “Punishing” the entire staff because you need to hire and train better, doesn’t make your employees want to stay. If you know that pay checks aren’t going to keep employees, but you value them and will work hard to get them to the pay they deserve, thinking outside the normal box of what recognition is, can help reduce that turnover. Recognition improves communication throughout your organization. Employees won’t come to a manager who only lashes out and doesn’t know how to articulate the good and the bad and provide them with solutions for change. At some point, everyone wants recognition, make your company better by doing it often, openly, and appropriately. I’ve written about recognition in the workplace at the very beginning of the year, so for me, it was great to have the discussion come back around and being able to complete my first webinar. We spoke about a few different ways to create the recognition and value throughout big and small organizations. Check out the replay and connect with these great women! Previous Post End of the Year Check – Who Is Loyal to YOU? Next Post Are You Ready to Lead?